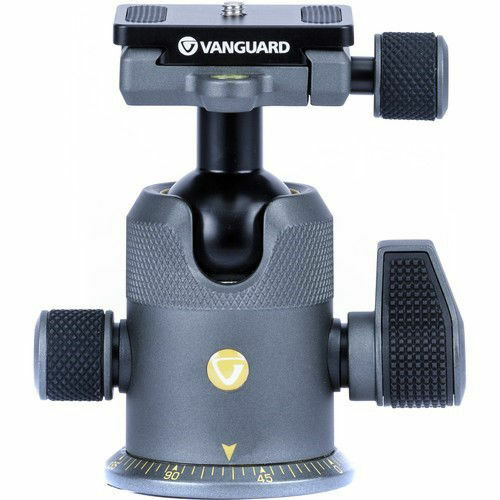 The Alta BH-250 Ball Head from Vanguard is a 1.25 lb Arca-type head that can support cameras that weigh up to 44 lb. Located inside the clamp is a safety pin that prevents the plate from sliding out if the clamp is partially opened. Moreover, the 4.6" tall head has three separate knobs to control it; the main locking knob governs the movement of the ball, the friction control knob adds or decreases drag on the ball per your comfort level, and the third knob enables the ball head to pan a full 360°. A single-cut notch on the side allows a mounted camera to move in a 90° vertical angle. Mounting the ball head to a tripod is easily done via the 3/8"-16 thread, but a 1/4"-20 bushing adapter is included for those tripods with a smaller thread. Additionally, a QS-60 V2 Quick Shoe is also included with the ball head.